Don't even bother reading this. Just watch it. This is one of those animes you just need to watch. Reading the descriptions, reading the reviews - that's not going to give you a good idea of just how awesome this anime truly is. I never knew that a story including fishing, aliens, friendship, and a duck named Tapioca could grip me like this anime did. It made me laugh. It made me cry. It made me bite my fingernails because OMG WHAT IS GOING TO HAPPEN NEXT?! I watched it by some happy accident, and I'm glad I did. It is now one of my favorites. The plot is outlandish, and yet it never ceased to disappoint. The characters are all likable. In this anime, there is no evil villain who clearly declares themselves as the Big Bad Guy. There are only humans. And, er, some aliens as well. And they will save the word... by fishing. So watch it and enjoy. And so, to my fellow friends who love Tsuritama, I'm out! Haino, haino, haino~ Yoisho yoishona! After trying out this Anime and watching the first episode, It kept me coming back for more and more. The Animation is superb and the story line is rather mysterious and keeps you on your toes, always seeking to know what's going to happen next!! Every episode is interesting and there isn't one scene that is slow, or boring on the eyes. The voice acting in this Anime is well done and the opening Theme is well in sync with the song. Surely this is one of those Anime's, where it's one of a kind. 5 stars! A Gem Lost At Sea!!! I couldn't believe people when they said that this was an amazing series. Just from quickly looking at it, I thought that it could never earn more than four stars. Guys, this just reafirms the proverb to not judge a book by its cover. The characters are great, the plot is superb, the animation and music are wonderful, and the flow of the series is flawless. It doesn't seem sporatic. It just keeps going wonderfully with the flow. If you want to delve more into the friendship side of series, this is a treasure waiting to be opened! I loved it! I've watched many shows and have enjoyed most everything I've watched. This shown in particular really has my special attention. Tsuritama is about an alien, a fishing prince, a secret agent and his duck, and a boy who looks...angry...when he's nervous. It looked like a weird show and I was just in the mood for something I could half watch. Something I could finish over a long period of time and not feel the need to make it into a marathon. I marathoned...and it was amazing!!! It made me laugh and the story line was funny and sweet. It had such a strange story yet you were rooting for the characters the entire time and hung on every moment. 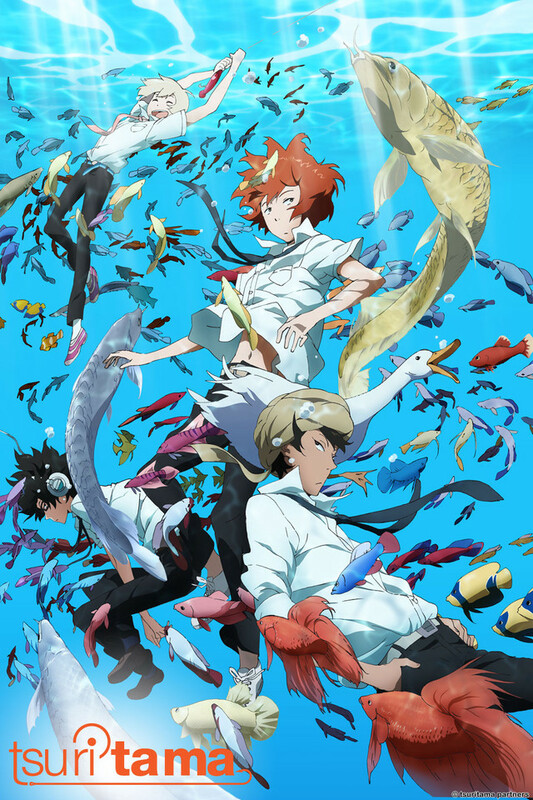 If you want a good, clean, funny, absolutely entertaining show then watch tsuritama :). I had a goofy grin on the entire show....I loved it :). You'd think with a plot that involves fishing and aliens this show would be quite odd. Coming from a girl who despises fishing and isn't too keen on aliens, I loved it! The show is absolutely adorable and the artwork is great! The show isn't very long, I finished it in one day. It had me on the edge of my seat at times and I even cried a little. I'm defiantly recommending this to my friends! Tsuritama has an overall calm feeling. It has the potential to make you feel really good after watching it, I would almost say refreshing. The music is cute and the signature dance is funny. I absolutely love Team Duck and the ending took me by surprise. The main character's social nerves were hilarious and the animation flowed beautifully. If you are into an anime that isn't all that into romance and just want a cute friendship, everyday calm and funny anime that is easy on the eyes and makes you feel good at the end. This is definitely the anime for you. If you liked this anime, you might also like Natsume Yuujinchou and Mushishi, they aren't as funny as this one but they are very laid back. This Anime Gets You Hooked From the Start. Tsuritama is amazing, that is all there is to it. From the art style to the lovable characters, it's amazing. When I first heard about it, (Like two days before I watched it), I was sketchy about it since it was about fishing after all, something I don't take much interest in, I wanted no part of it. After watching the first episode, I was hooked, I really just wanted more of it. It really had a way to make me want more, with some amazing drama (some of which, I didn't expect at all) and very cool action sequences (in the fishing parts). All in all, I loved it all the way. I went into this anime very skeptical. I had absolutely no interest in fishing, I just wanted to see what all of the hype was about. And man am I glad I did, because I liked this anime a lot. It was cute, bright, funny, original, and in my opinion very enjoyable. I really had no idea what to expect from this series except that it was vaguely about fishing. It's true there is fishing, but what it leads to is not even remotely what I thought it would be. It turned out much better than I had hoped. The story starts off a little slow and some might be tempted to drop it in favor of something more fast-paced. However, I recommend sticking it through. The beginning is slow to build up characters and also to drop you hints. That's right, stuff is done and said that will make sense by the end! The art style is lovely (well, I liked it anyway) and the animation was usually pretty good. There were a few instances that I felt the animation was too stiff for the scene being portrayed. Still, for the most part it was very high quality. I enjoyed the beginning and ending theme songs. In fact, the intro theme is really catchy! It makes me want to get up and do the silly dance with them! I highly recommend this series! It fun, it'll make you smile, and you'll probably be teary eyed by the end. A classic- in every sense of the word. I'm not using that word lightly. Everything about this anime is original. The plot is woven together so intricately, and I'll just say this from the get-go- don't think for one second is will be boring by virtue of its connection to fishing. It is anything but boring. The characters are everything but boring, especially Yuki. He's unlike any protagonist I've ever encountered; he's not asking you to like him. He has this refreshingly real personality, as does Natsuki. Haru can be a tad bit annoying at times, but that's just my objective perspective. (Akira...is the best. Enough said). Just take a solid wad of time out of your day to enjoy this show. Have your friends gather around to bask in its awesomeness. Trust me. You won't regret it.